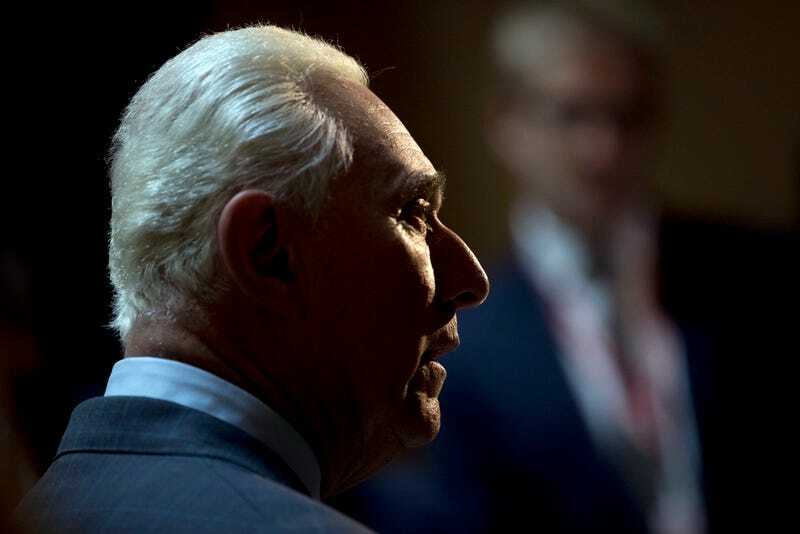 Roger Stone is one of President Trump’s most vicious attack dogs, whose bark has always been worse than his bite. But the dog has been muzzled, at least by Twitter. Stone has been suspended from using the social media platform, and according to Buzzfeed it’s a permanent ban. Stone is a veteran of numerous political campaigns dating back to the 1970s and even has a tattoo of President Nixon on his back. But more recently, he’s been a die-hard supporter of President Trump and a frequent guest on the conspiracy theory show InfoWars. Stone believes that President Trump is being poisoned by his own staff in the White House, among plenty of other weird things. But despite reports from Buzzfeed that he’s off the service for good, Stone is seemingly under the impression that his ban is temporary. Gizmodo has reached out to Twitter for independent confirmation that Stone’s ban from the platform is permanent. We’ll update this post when we hear back. Update, October 29th, 9:05am: It looks like Roger Stone is now tweeting under the (unofficial) account for his Netflix documentary, Get Me Roger Stone. Twitter has yet to respond to Gizmodo’s request for comment on Roger Stone’s account. Update, October 29th, 10:00am: Stone has told Politico that he’s thinking about legal action against Twitter. “This is a strange way to do business and part and parcel of the systematic effort by the tech left to censor and silence conservative voices,” Stone said of his ban in a statement to Politico. What will Stone sue over? Your guess is as good as anyone’s. Twitter is a private company that doesn’t have to allow anyone on its service.